CELL-tainer DACS is developed CFR21 part 11 compliant which means this software can be used under GMP conditions. 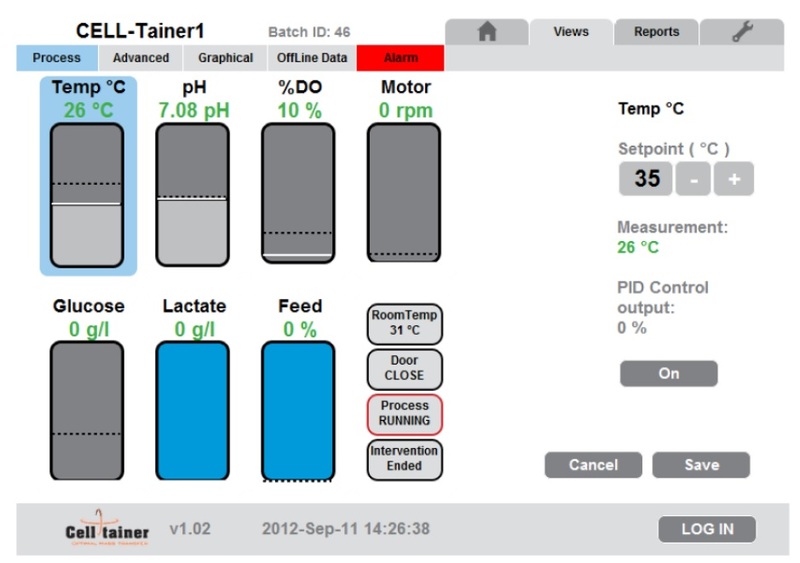 CELL-tainer DACS is initiated to create a more user friendly data acquisition system for the CELL-tainer®; all settings for each parameter are shown and adjustable in one view. CELL-tainer DACS is installed on a computer on top of, or close to, the CELL-tainer® and can be accessed and controlled by a computer in the network. CELL-tainer DACS has a two-level password protection (administrator and operator) and multiple users can be defined with each user having its own username and password. Also multiple CELL-tainers® can be connected to one computer running CELL-tainer DACS. Offline data entry can be done during and after the run, because of this the offline data can also be plotted in the same graphical view. These graphs can be plotted by one click, however, the data which have to be plotted is customizable by selecting only the parameters you want in the graph. All the data of all the runs will be stored on the computer and for each of these runs, the data can separately be shown in graphs, tables or downloaded in files. Next to this data presentation of previous runs, the data acquisition of the current run is real time saved on the computer running CELL-tainer DACS and can be treated like data of previous runs. All these features and improvements provide the user with an easier and more sophisticated system control. The full specifications of the CELL-tainer DACS can be found under Manuals.